[INQ. NO. 1311C16] EV Relay is a power switching relay using high voltage (DC450V) for recharging an electric car or battery pack. As the electric contact works in gas atmosphere, the EV Relay has a constant contact resistance and contact reliability all the time. 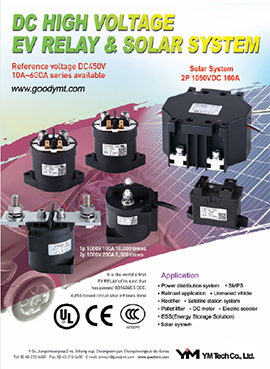 With low noise, compact design and lower energy consumption, it is one of the best electric vehicle relays that will allow your DC system to work safely. YM-Tech Co., Ltd is one of leading manufacturers focusing on developing and producing special relays needed for everyday life and industrial fields such as Power Relay, Latch Relay, Latch Contactor Relay, DC Contactor Relay, EV Relay, etc. Under the corporate philosophy of “technology development with venture spirit and quality management for maximizing customer satisfaction, all of staff members of YM Tech is further striving to provide to quality products energy saving devices to customers on time. Filed Under: Machinery Tagged With: battery pack, electric car, EV Relay, YM Tech Co. Ltd.